Recently, I became aware of a slight water problem (as if the word slight has any business hanging out with the words water and problem) in our basement. Somewhere between when our house was built and when we bought it, the bathroom had been rearranged. The plumber (or DIY’er) who did the work, rather than move the lines and start fresh, merely just capped the old water supply lines off. The standard caps worked (and work) just fine. However, one of the caps wasn’t really a cap. It was a shutoff valve. Whoever it was merely capped the output of the valve and turned the valve to the shut position and left it at the end of the line. Any engineer will tell you that the more moving parts and connections there are, the higher the liability of failure. Eventually, the metal of the valve began to corrode. It corroded until it began to leak. Which is where I come in. While downstairs, I noticed that one of our kids’ buckets that was being stored for the winter was full of water. There weren’t any obvious leaks, and the concrete floor around it was dry. I couldn’t find a good reason why someone would have filled it with water and then taken it down to the basement, so I took a bit closer look. Turns out, that valve was leaking. Slowly enough, thankfully, that it wasn’t causing any problems. According to my wife, who noticed the leak months ago (BAD wife!!! ), it’s been leaking for a while. As with any issue like this, I’ve got two choices. I can call a plumber and get it fixed, or I can attempt to fix it myself. I’m pretty comfortable with building things and fixing most things. Electrical and plumbing are probably the two things that I don’t like to mess with. When we replaced the sink in our kitchen, it took 3 attempts and several months of trying before I had a working sink without any leaking. I did manage to remodel the bathroom recently though, and replaced the toilet without any major issues. So, going off of that, I decided to see what was involved by doing a few searches online. After my research, I found that there are essentially only one or two ways to go about fixing the issue. All involve cutting the pipe off, and re-capping it. Or, properly capping it, as the case may be. The 100% best way would be to cut the pipe, and then flux and solder on a new cap. Done right, it’s almost impossible to break and a pretty good guarantee to never leak. The problem here is that I’ve never done any of that and don’t own a torch, so would have to buy one of those. They’re not expensive, but would certainly add to the cost for a tool that I have infrequent enough use for that I don’t already own one. The second way would be to put what is called a compression fitting over the end of the cut off pipe. The idea there is that there’s a compression ring in the fitting that, as the nuts are tightened, compresses the pipe into the fitting and creates a watertight seal. No special tools necessary. I hadn’t done either before, so it was still up in the air. Add to that the fact that there is no water cutoff to that part of the house and the water to the entire house would have to be shut off once the project started and remain off until the project finished. In the end, I did decide to give it a go myself. My reasoning was that the worst case scenario wasn’t all that bad. Worst case, I can’t get it fixed and have to call a plumber. I’m out the money for the parts (~$10) and the water in the house would be off until the plumber came. Even if the plumber is super busy, I doubt it would be more than a day of waterless-ness. Inconvenient? Sure. But, it could be a lot worse, so not horribly worrisome. Worst case, it costs me some money and some water free time in the house. We’ve got friends who live close enough that we could use their house for water activities like showering. And a couple of gallons of filled water jugs would be enough for emergency flushing of the toilet. I’ve never had the pleasure of a DIY plumbing project going right the first time. Until now. The procedure was certainly not an overly complicated one. I turned the water off to the house. I cut the old fitting off, making sure to get the cut as square as possible. 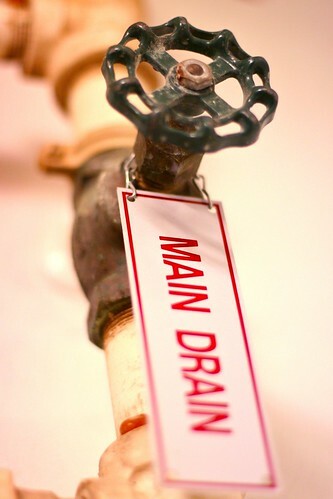 As a note, I tried to drain the pipes before cutting the old fitting, but very little water came out. I left the drain hose open while I was cutting. Once I had the old fitting off, the rest of the water drained from the drain hose. I believe this was because it had created a vacuum of sorts and it was only released when I opened up the other end to vent. I then took a bit of sandpaper (160 grit, I believe) and sanded all the old grime and corrosion off of the end of the pipe. Not sure that this was really necessary for the compression fitting that I decided on, but better safe than sorry. As soon as that was done, it was as simple as putting the fitting on the pipe and tightening it down. Not only was it pretty simple and easy, but it didn’t leak when I turned the water back on. Awesome! There’s one other cost involved that I didn’t mention, and, it may be the most important. It’s the cost of not doing it yourself. Sure, it would have cost me the cost of the plumber to fix it. But, it would have also cost me in experience. I learned a new skill. Granted, capping a household supply line isn’t necessarily high up there on a list of desired skills, but I won’t hesitate to do it again. Plus, I’m now able to assist others who have a similar task and save them money too. To me, that adds value to having done it myself. It’s like getting paid to do it. When you add all that up, the cost of not doing it yourself is almost always too much.